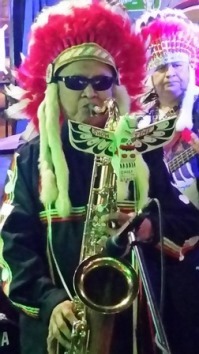 Delighted to have the legendary Al Stager, front man and saxophone player for Sound Tribe among the talented musicians playing at the “Rising From the Ashes” benefit concert, April 14, 8:00 p.m. at the Lytton Memorial Hall. Stager will be joined by artists like Fendermen front man and lead guitarist Ritchie Adams to put on an evening of country, rock and roll and blues music. Admission by donation. Proceeds to fire relief for assist Interior communities hit hard by the 2017 wildfire crisis. Part of the NPTGS’ “10+” anniversary celebration, April 14-15 in Lytton. In partnership with the Lytton First Nation. As part of those celebrations, don’t miss the Chief Cexpe’nthlEm Recognition and Reconciliation Storytelling Circle, celebrating the courage and wisdom of Chief Cexpe’nthlEm in bringing peace to B.C. in 1858 by negotiating an end to the Canyon War with American militia Captain Snyder. Descendants of Chief Cexpe’nthlEm and Captain H.M. Snyder will participate, as will traditional knowledge keepers from the Nlaka’pamux and other First Nations, drummers and dancers. April 14, Chief Cexpe’nthlEm Precinct, Parish Hall, commencing at 4:30 p.m. Check out our event page.